Attorneys are preparing cases for adults, children and babies who were harmed by over-the-counter oral health products that contain benzocaine. Potentially hundreds of lawsuits may be filed against manufacturers of these products, many of which were marketed to treat teething pain in infants. Under pressure from an advocacy group, the FDA in May 2018 ordered manufacturers to warn consumers about the risks of potentially deadly benzocaine products to treat teething pain in infants. The deaths of at least four people, including an infant, since 2009 have been linked to an oxygen-draining side effect of benzocaine called methemoglobinemia, the U.S. Food and Drug Administration said. Consumer lawsuits are being evaluated against manufacturers. A long-known side effect of benzocaine, methemoglobinemia happens when oxygen levels in the blood drop dangerously low. Symptoms can develop within two hours of using the products. They include cyanosis (bluish color of the skin) and chocolate brown-colored blood. More than 400 people have developed methemoglobinemia from benzocaine use since 1971, the FDA said. The advocacy group Public Citizen filed a lawsuit against the FDA in 2017. The lawsuit sought to force the agency to act on a petition Public Citizen had filed in 2014 over benzocaine uses and warnings. The petition asked the agency to remove infant teething pain as an approved use for benzocaine. Public Citizen asked that the label advise against using products with that chemical for infant teething pain. The group also requested warnings about the risk of methemoglobinemia on all benzocaine products used in oral care. Public Citizen’s lawsuit says regulators have known as far back as 1991 that the chemical is linked to methemoglobinemia. But no warnings were issued to the public for more than 25 years. In 1991, the FDA classified benzocaine as an over-the-counter analgesic and anesthetic. It noted such products are not necessary or useful to relieve teething pain. That’s because they tend to wash off the baby’s gums within minutes. At that time, the advisory review panel involved in the classification recognized that the link to methemoglobinemia, according to Public Citizen. The panel also knew that infants are more susceptible to the condition. 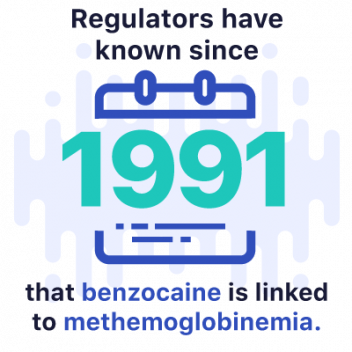 Between 2003 and 2014, the FDA issued several safety announcements regarding benzocaine’s risk of methemoglobinemia. In 2014, the agency told manufacturers of over-the-counter, oral-health products it wouldn’t object if they added a warning about the blood condition to their product labels. The FDA did not require the warning until May 23, 2018, a day before it responded to Public Citizen’s lawsuit and petition. “We have carefully considered your requests and share your concerns regarding the risk to public health posed by over-the-counter (OTC) oral health care drug products containing benzocaine,” said a letter from Janet Woodcock, director of the FDA’s Center for Drug Evaluation and Research. Source: Letter from Janet Woodcock, director of the Center for Drug Evaluation and Research. 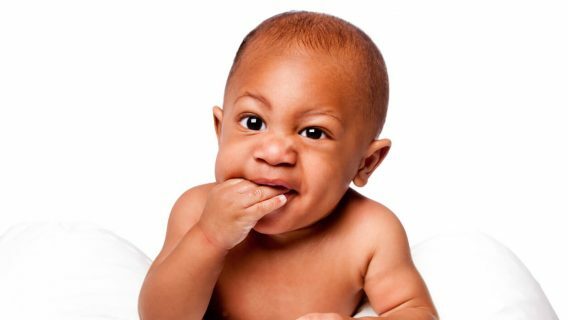 The FDA also urged manufacturers to stop marketing over-the-counter oral products for teething in infants and children younger than 2. “If companies do not comply, we will take action to remove these products from the market,” the FDA announcement said. Public Citizen’s health research group director, Michael Carome, chastised the FDA for taking so long. At least one company, Church and Dwight Co. Inc., said it would discontinue teething products. The New Jersey-based company withdrew four Orajel teething brands, including Orajel Medicated Teething Swabs and Baby Orajel. “We are not discontinuing other Orajel products, which represent the majority of our Orajel offering,” the company said in a statement emailed to CBS News.